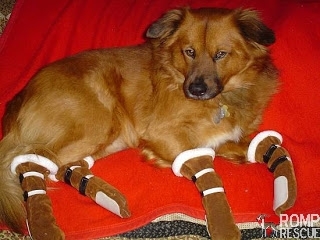 It’s cold out and your dog doesn’t need to suffer – make him or her some easy DIY dog boots to protect their feet! 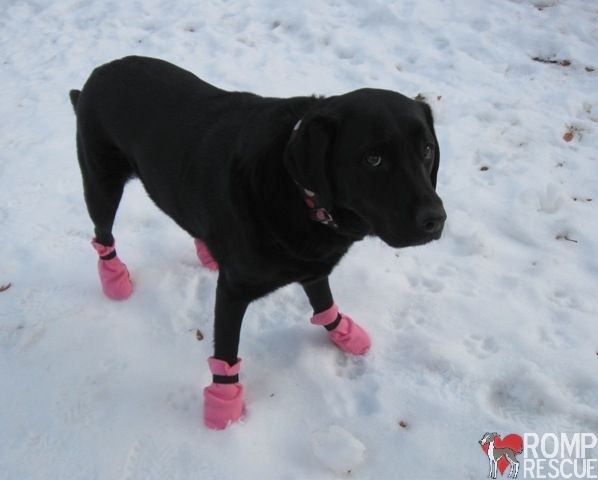 There are a lot of reasons to protect your dogs feet including slippery ice, harmful salt that hurts their paws, the cold elements like wind and snow, sharp objects that can be hidden in the snow and even to help with their visibility! The material you want your boots made out of (we recommend polypropelene as it is relatively non abresive on their feet and doesn’t absorb water easily, you can use fleece for light use but keep in mind it absorbs water easily (although great on the paws), or you can possibly use corduroy as it is heavy duty material but keep in mind is a bit abrasive on their paws). If you want to get real fancy, you can use cordura for a bottom portion and 200lb polar fleece for the top portion taht doesn’t touch the ground and just protects their legs from the elements. 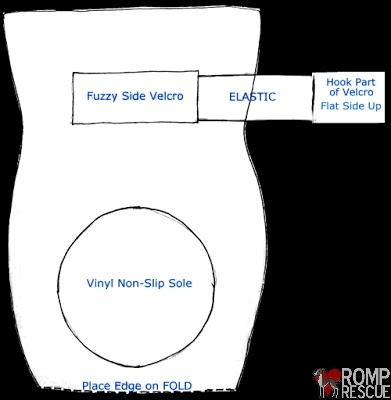 Determine dimensions for the DIY dog boots. Measure their paws circumference and leg length: measure all the way around the widest part of your dog’s foot, add 1 inch for seams. Determine how high you want the boot to go on your dog’s leg (Italian Greyhounds have long boots because their legs are skinny, they get cold easily, and it helps them keep their boots on) and note where their legs bend. Cut a rectangle that is half of the foot circunference and twice the length you want the final boot to be. For example, if your dog’s foot is 4 inches around (including the inch of seam allowance) and you want the boots to be 6 inches long, you need four rectangles 2 inches wide and 12 inches long — one for each foot. 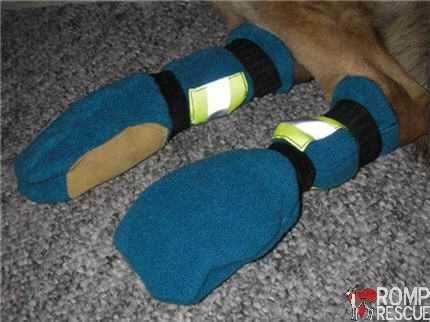 Attach Velcro to secure the DIY dog boots. Pin a 1-inch long tab of the soft side of your Velcro to the back of the boot. 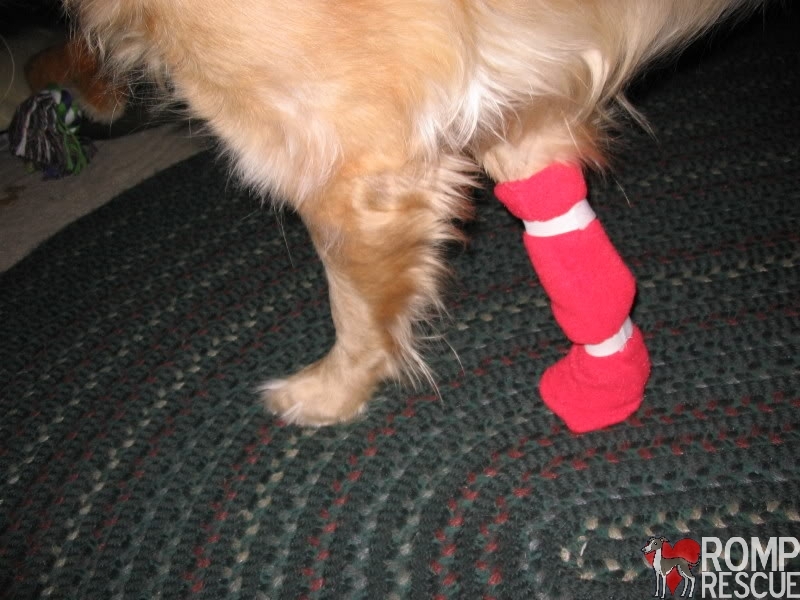 Cut a piece of elastic one inch shorter than the circumference of the DIY dog boot. Pin one end of the elastic under the soft Velcro tab. Stitch the Velcro tab all the way around, sewing the elastic in place. Sew a corresponding hook tab to the other end of the elastic, hook side in. 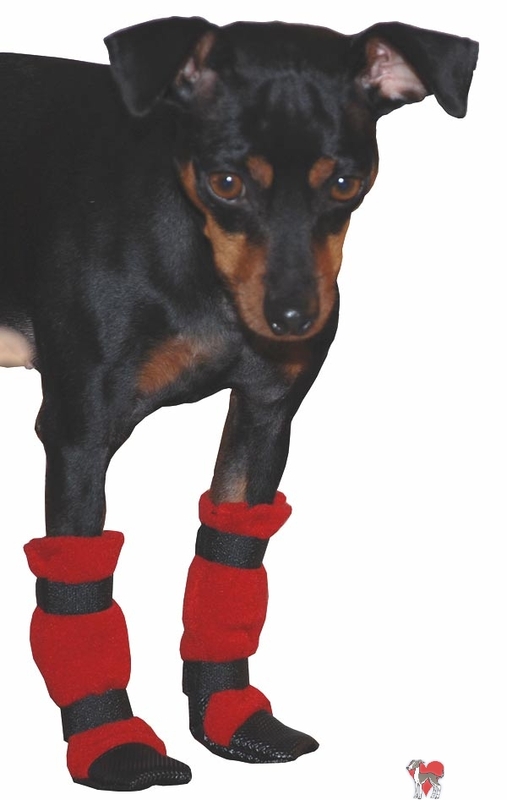 The elastic will wrap around your dog’s leg and the Velcro will hold it in place, keeping the boot on your dog’s foot. Add the traction material. Cut a circle that is about 3/4 the width you made the initial design. Sew onto the boot. You can opt to add kitchen calk or puffy paint instead (or in addition to) as it also acts like a traction material. There’s a downloadable version here. 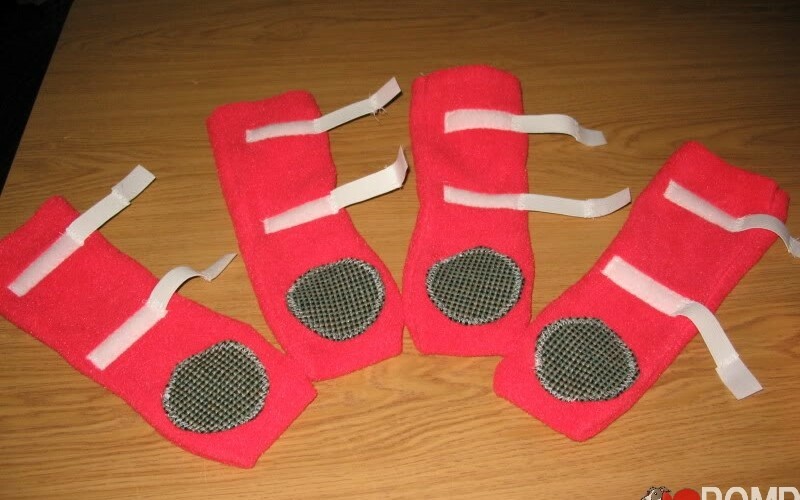 This is a finished product that provides coverage, safety, and warmth for your dogs paws! This owner added a reflective material to the boot, made it longer to cover more leg and made the traction pieces much larger. Here is another one that is full leg, I like how this owner made it the same color as her dogs fur and added some furry lining inside! 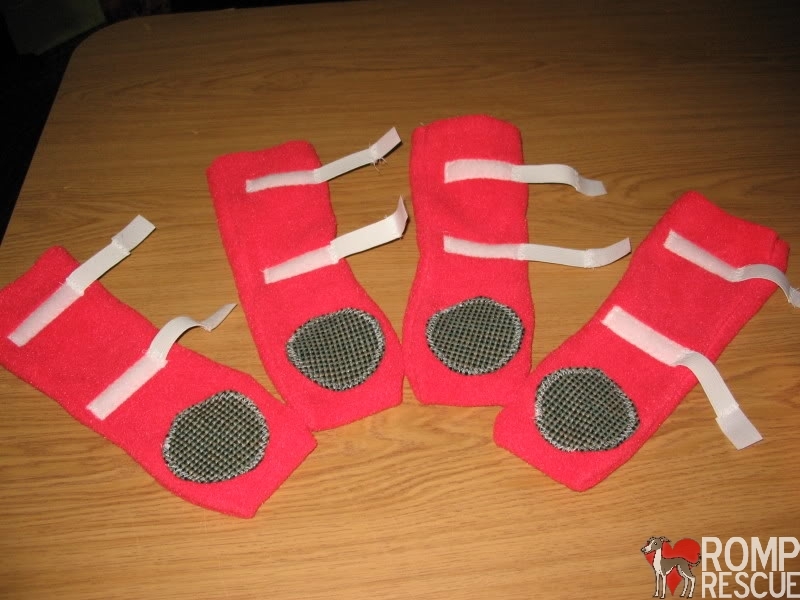 This shorter design is great for dogs that only need booties! This is what it would look like if you wanted to use fleece for most of the boot but corduroy for the ‘paw’ portion to protect from the watery elements and abrasive ground material. Note how the corduroy has about twice as much material in the back as in the front. 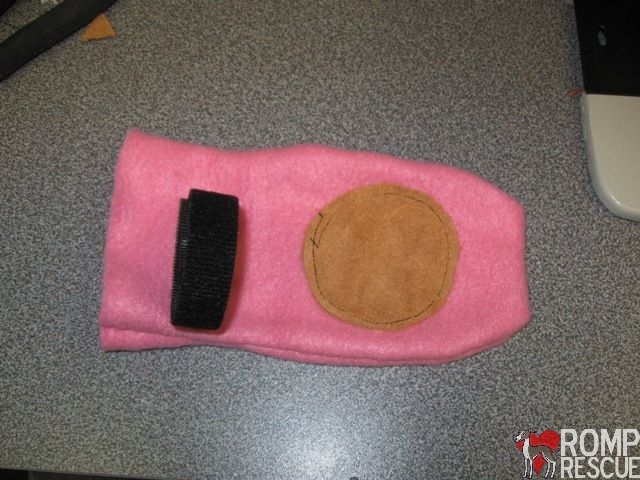 Also note the placement of the Velcro – it goes after every bend in the leg. This entry was posted in ALL, Pooch Projects and tagged booties, boots, diy, diy dog booties, diy dog boots, diy dog snow boots, do it yourself, dog booties, dog boots, dog snow boots, hand, hand made, handmade, home, home made, home made dog boots, homemade, pattern. Bookmark the permalink. Where do you buy the cordura? What type of cordura is it? Any fabric store should have it, the type is up to you. We use fleece personally but others have used corduroy.